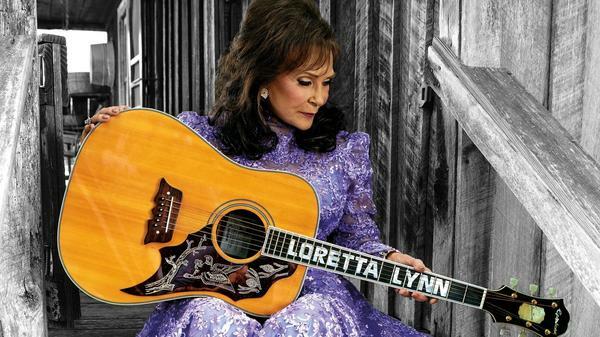 Full Circle is Loretta Lynn's first album in nearly 12 years. Loretta Lynn's career in country music has spanned decades. She's recorded more than 200 songs, and more than 50 albums. Her latest, out today, is Full Circle — and it's a fitting title, considering that the self-dubbed "coal miner's daughter" has lived more in her 83 years than many might live in two lifetimes. Lynn's recording success has been punctuated by loss, including the deaths of her husband Rooney "Doolittle" Lynn and two of their children — and before that by marital tumult. Reflecting on her husband's struggles with alcohol and his tendency to get violent, Lynn says her younger self lacked perspective on what makes a healthy relationship, and had to rely on her wits. "When he hit me, I hit him twice. He got the wrong woman to fight with, because I was raised with a bunch of boys and I whupped every one of my brothers," Lynn says, laughing. "You know, I was tough. I had to be tough. To be married to him for all them years, too! Girls, listen: You gotta be tough." Lynn spoke with NPR's David Greene about what's changed since her younger days, as well as her decision on Full Circle to remake her iconic song "Fist City." Hear more of their conversation at the audio link. Let's hear now from a legend - country singer Loretta Lynn. She's recorded more than 50 albums. Today she's out with another called "Full Circle," and that's fitting. This coal miner's daughter from rural Kentucky has seen a lot in her 83 years. Her recording success has been punctuated by loss, including the death of her husband and two of her children. Our colleague David Greene talked with her about loss and family and something she wrote songs about - her husband's struggles with alcohol and his tendency to get violent. David began his conversation with her by talking about her new take on the iconic song "Fist City." LORETTA LYNN: (Singing) If you don't want to go to fist city, you better detour around my town 'cause I'll grab you by the hair or the head and left you off of the ground. Well, can I ask about "Fist City?" You wrote that long ago about where a woman who was eyeing your husband might end up, right? LYNN: Yeah, and she did. GREENE: Was it your fist? GREENE: I've got to hear that. What happened? LYNN: Well, can't tell you everything. GREENE: OK, tell me what you can. LYNN: (Laughter) Well, she was trying to take Doolittle away from me, and she was just one woman. And that's - and I told her that. LYNN: And that's where I left her. GREENE: Where did you confront her? LYNN: I think on her front porch. I think I went to see her. GREENE: Now, are you hesitating because you're worried the police might come back and find you if you say too much or something? LYNN: You know, I don't want to - she's got children. GREENE: ...And I just heard it on the radio. OK, fair enough, but you took care of her. LYNN: I took care of her. GREENE: OK. You also put - and I know you've been more willing to talk about this one - you put your fist into your husband's face sort of accidentally. LYNN: He came in, and he told me he was going to take me someplace. And he never took me nowhere. I had four babies, one right after the other. And he walked by and he took a hold of one of my pin curls and pulled it, and it hurt. He was drinking a little bit. GREENE: And you were thinking he was coming home to take you out on a date. LYNN: So I turned around to hit him on the shoulder. I didn't mean to hit him in the mouth and teeth flew everywhere. Lord, I knew I was dead. And it kind of scared me, you know, but he laughed. LYNN: No because when he hit me, I hit him twice. He got the wrong woman to fight with because I was raised with a bunch of boys. I whipped every one of my brothers. LYNN: You know, I was tough. I had to be tough to be married to him for all them years, too. Girls, listen, you've got to be tough (laughter). GREENE: Well, I love that you're speaking to girls. What would you tell them about how to decide whether to stick with a husband who can get violent sometimes, does some drinking? LYNN: I wouldn't tell them to stick with him. Back in them days, I was brought up that way. I had four kids. You had to think a little bit. GREENE: What would you tell girls today? LYNN: If one started whipping on him, I think you should leave him. GREENE: There's a song on this album, "Wine Into Water." LYNN: I love that song. That's one of my favorite songs. GREENE: You want to listen to a little bit of it? LYNN: (Singing) So tonight I'm as low as anyone can go. I'm down, and I can't seem to fall much further. Yeah, once upon a time, he turned water into wine. Now I'm on my knees and I'm begging to you, father, would you help me turn the wine back into water? GREENE: See, I read that you talked about wishing that you had sung that song to your husband, who's passed away, we should say. What did you mean by that, Loretta Lynn? LYNN: Well, that kind of fits in, doesn't it? Turn the wine back into water. I think that hits everybody that drinks. When you're an alcoholic, you're an alcoholic. There's nothing you can do about it except get help. GREENE: You never got the chance to sing it to him. LYNN: No. I didn't get the chance to sing it to him. LYNN: (Singing) Is there one troubled soul these hands of mine could hold? Who's going to miss me when I'm gone? GREENE: You've outlived your husband and two of your kids. GREENE: Who we should say was tragic - tragically drowned in 1984. LYNN: Well, it's an awful thing to lose a kid. You don't - you don't prepare yourself to lose your kids. And there's no way anybody will understand that until they lose one. I don't think you're meant to lose your kids, you know? GREENE: You said once that he makes you less afraid of dying. LYNN: Well, we all have to do that. And he's already done it, so evidently I shouldn't be so afraid of it. But I am - I'm afraid of dying. I don't think there's anybody living that don't know what - ain't wondering what death is and what's going to meet him afterwards. GREENE: You don't seem like you're planning on doing this anytime soon. LYNN: I'm not planning on going nowhere. I think God says Loretta, here's the (unintelligible). I'm going to leave you alone (laughter). GREENE: Before I let you go, I have to hear about this - this duet with Willie Nelson that's on this album. LYNN: Me and Willie had a ball doing it, and we ended up on stage together and darned if we didn't start laughing. I said we can't do this (laughter). GREENE: It's not a funny song? LYNN: It's a sad song. I can't remember now exactly what it said. But let's see - I raised my eyes and set myself (singing) in the eyes of a storm in the belly of a whale. It's really a sad song - (singing) on solid ground, I'll be at peace when they lay me down. Yeah, it's kind of a sad. But it's an uplifting song, too. GREENE: What's the history of it? LYNN: Well, when they lay you down, you're going into the ground. GREENE: (Laughter) I get that part. LYNN: (Laughter) I ain't ready to go there, but I think that's what Willie was laughing about, me and him. We ain't going nowhere. LORETTA LYNN AND WILLIE NELSON: (Singing) When they lay me down someday, my soul rise and fly away. This old world will turn around. I'll be at peace when they lay me down. GREENE: Loretta Lynn, I can't tell you what an honor it's been to talk to you and look forward to talking to you for the next album. LYNN: Well, thank you, honey. MONTAGNE: Loretta Lynn's new album is called "Full Circle." She spoke with our colleague David Greene. Transcript provided by NPR, Copyright NPR.